BD Diesel UpPipes replace the factory exhaust feed system (exhaust manifold to the turbocharger) which is prone to leakage due to the deterioration of the exhaust crush donuts. The escaping exhaust and heat from the deterioration eventually burn out the feed pipes causing loss of turbo drive pressure and increased EGTs. The exhaust crush donuts with stainless steel gaskets for extended sealing life. New designed Stainless Steel piping with sizing to maximize transfer of heat energy to the turbo come with less restrictive, internally shielded expansion bellows that are not exposed to exhaust gases thus reducing the chance for burn out. 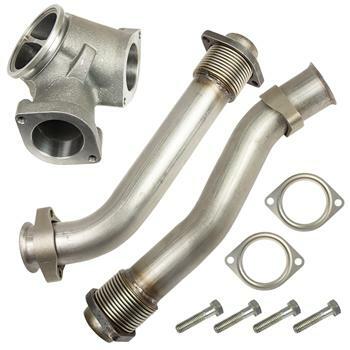 The turbo Y-adapter is made from the same proven high-silicon ductile iron used to make our exhaust manifolds. The BD UpPipes are a durable, longer-life replacement for this common PowerStroke problem and is perfect as an upgrade while performing other engine or transmission repairs.